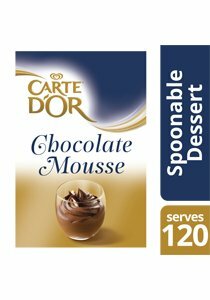 CARTE D'OR Chocolate Mousse is a rich and light mousse that is great on its own or as a filling for cakes or tarts. Place cold milk into a mixing bowl and add CARTE D'OR Chocolate Mousse Dessert mix. Beat in electric mixer for 1 minute on low speed, then for 2 minutes on high speed. Portion and refrigerate at least 90 minutes, or until set. Weight - 1440 g. Makes 120 portions.